Successive Ethiopian governments have used land grabbing as one of their many strategies to economically and politically marginalize the Oromo and other oppressed people in the empire. Millions of Oromo farmers have been evicted from their ancestral lands and reduced to being subservient to the ruling classes. This process continues to this date unabated. The current Ethiopian regime, led by the Tigrai People’s Liberation Front (TPLF), in collaboration with its own creation of satellite political organizations like the Oromo People’s Democratic Organization (OPDO), has continued the practice with greater sophistication and deceit. During the last 26 years of TPLF rule, hundreds of thousands of Oromo farmers have been evicted against their will with minimum or no compensation. This is specifically true for those who were living around Finfinne (Addis Ababa). Confiscated farmlands were distributed freely, or with minimal payments, to TPLF cronies and their foreign sponsors leaving the poor Oromo households with no other options than being homeless and street beggars. 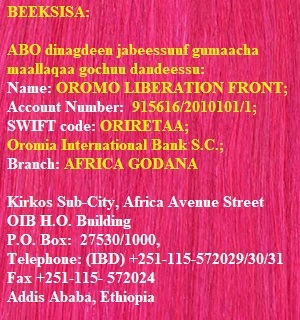 The OLF has repeatedly issued statements to make this cruel actions of TPLF known to public. In rural areas of Oromia, large hectares of lands were taken from farmers and leased to the national and international investors under the pretext of development. The truth, however, is that Oromo farmers never benefited from the so called development. To the contrary, their entire life turned upside-down and their family, lifestyle, culture, and tradition was destroyed. It was with this background that the TPLF declared the so called Addis Ababa integrated development plan (aka “The Master Plan”) to expand the capital city by a radius of 100-km into the Oromia regional state. The Master Plan triggered region–wide peaceful protests by Oromo youth and the general populace, which later expanded to other regional states. Instead of addressing their grievances, the dictatorial minority regime resorted to indiscriminate killings that resulted in the death of over two thousand peaceful protestors. If it was implemented as intended, the Addis Ababa master plan would have displaced about two million indigenous households without compensation and nowhere to go. The consequence of such an evil action by the TPLF would have been disastrous. The TPLF regime has been trying hard to divert the real demands of the Oromo people by giving various excuses and employing old and tired tricks instead of tackling the real problem. As part of its usual treachery, the TPLF regime is promulgating the so called draft proclamation on “Oromia’s Special Interest over Finfinne (Addis Ababa). The 1995 Ethiopian constitution clearly states the special interest of the State of Oromia on Finfinne (Addis Ababa). For quarter of a century, TPLF never wrote a law that grants this special interest to Oromia. The question one should ask is then, why now? Does this proclamation answer the demands of the Oromo people over Finfinne? As stated above, TPLF’s expropriation of the Oromo land is a continuation of the policy of its predecessors. Following the conquest of Minilik, for example, conquered Oromo lands were distributed among his military leaders. Large portions of the confiscated lands were owned by the government and subject to sale or heavy taxation. In doing so, the Minilik government systematically destroyed not only the territorial and traditional kinship structure of the Oromo people but also the political, economic and social institutions upon which the Oromo identities were built on. With the displacement of the indigenous Oromo people and the heavy influx of the Abyssinian settlers, the demography of the Finfinnee and its environs changed rapidly and systematically. This made the Oromo population in Finfinne to be considered as a minority. Historical places in Finfinne and its surroundings were destroyed and their original names changed into Amharic names, including the name of the city itself that changed from Finfinnee to Addis Ababa. After controlling Finfinne (Addis Ababa) in 1991, the TPLF leaders also repeated exactly what Minilik did a little over a century ago; they partitioned Oromo lands freely among themselves and their cronies by forcefully displacing the native residents. 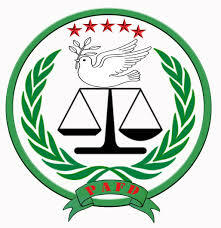 TPLF also adopted a law that grants land in Finfinne and its surroundings to their members who served in the front. According to the Ethiopian constitution, Finfinne has assumed the status of a state. It is also a seat of the Federal government, Oromia regional state and many international organizations. 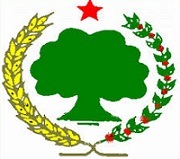 Finfinne is administered by the federal government, which allow the TPLF to control its economic and social development. In fact, TPLF intentionally excluded Oromia from its administration. Thus, until now, Oromia and the Oromo people have hardly benefited from its development. The current proclamation will not address the real interest of the Oromo people on Finfinne at all and thus, TPLF and its cadres will continue to be the beneficiary of the socio-economic developments of the city. 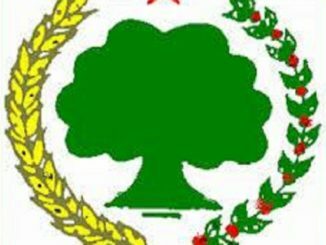 The Oromo Liberation Front wants to reiterate that Finfinne belongs to Oromia. It is not only geographically located in the heart of Oromia, but Finfinne is also historically the center of Oromo culture and identity. 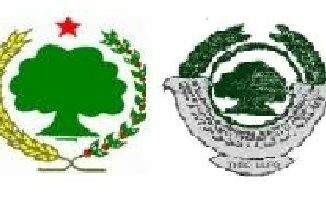 Thus, OLF believes that Oromo people should have the rights of full ownership over the Finfinne and thus should play a full administrative role. 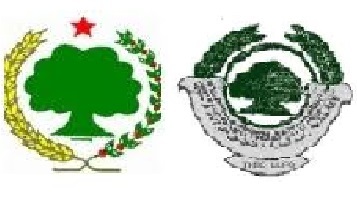 OLF also want to make clear that the fate of Oromia is not different from that of Finfinne. Therefore, the struggle to stop TPLF from exploitation of Finfinne should be part of the struggle to liberate Oromia and the Oromo people. We, thus, call upon all Oromo people from all corners of Oromia and beyond, to stand together for the purpose of removing TPLF tyranny from our nation and people. Once again, we would like to remined our people that the current proclamation does not serve the interest of our people and nation in any way and thus must be resisted by any means at any levels.